Published on June 28th, 2017 by Bojan Janjanin. Your Pro subscription renews July 18, 2017. To continue using Pro, no action is required. Your credit card will be charged $36 for another year on the date above. If you’d like to cancel your subscription, you can do so from your billing page. 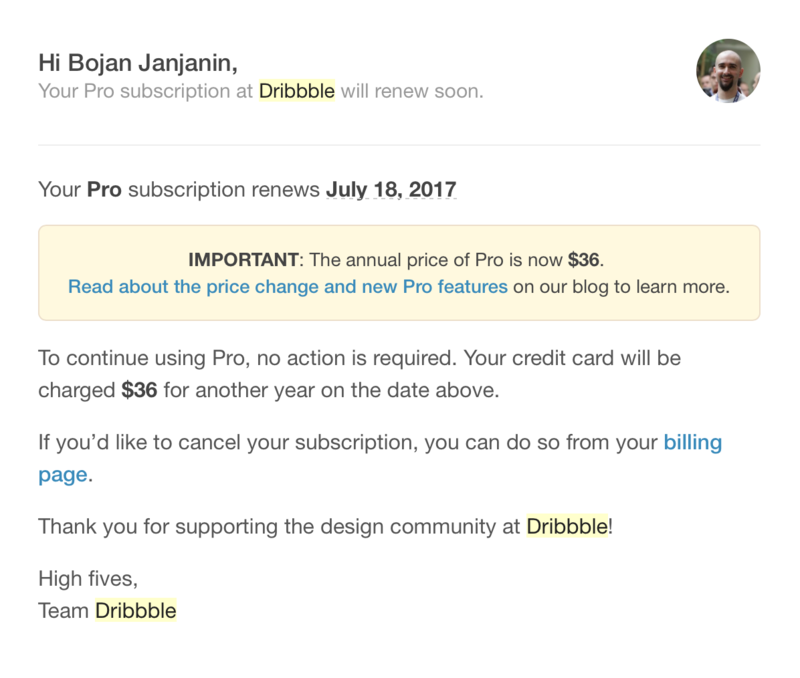 This is how Dribbble reminded me of my subscription. Awesome work, Dribbble. Some websites, like the Eurosport Player don’t do this and you get charged without a reminder. You’re also unable to cancel the next subscription in the last 3 days of your current subscription, which they fail to tell you about. It’s in the small print, but they don’t make the effort to remind you. Always think about your users and remind them about stuff.